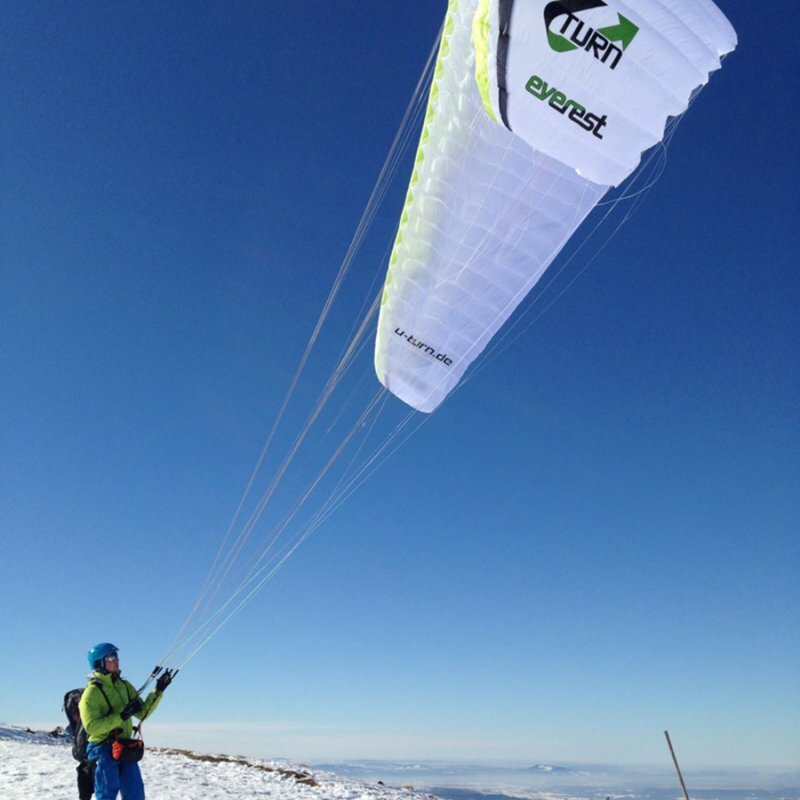 The EVEREST is the first climber‘s glider, which was designed for performance. It was designed for the hard alpine usage and for Hike&Fly adventures and convinces mainly with its flying features besides its small pack size. 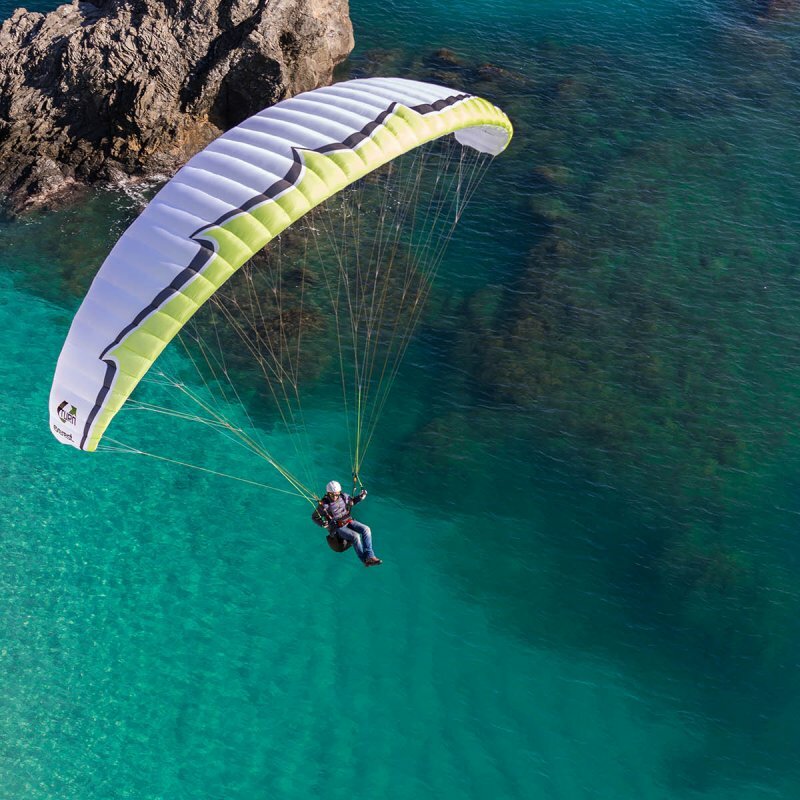 The very light performance wing is one of the lightest paragliders worldwide. It efficiently transfoms thermal into height and is equipped with a great deal of power. Nevertheless the small weight of the canopy facilitates its sweet-tempered features. The wing reacts precicely to the control pulses and without any delays. The EVEREST is aimed at all pilots who don‘t want to renounce performance when flying alpine. Altough the focus was clearly on the reduction of weight and pack size, there shouldn‘t be any compromises when it comes to durability. This way a few more grams were accepted to give the glider the full-value equimpent to also make it suitable for daily use. The name says it all: the EVEREST by U-Turn is addressed to hikers, mountaineers and climbers who love to finish their trip with a glide down in the valley. Here for chief designer Ernst Strobl designed a wing perfectly located in the triangle weight reduction, durability and performance. 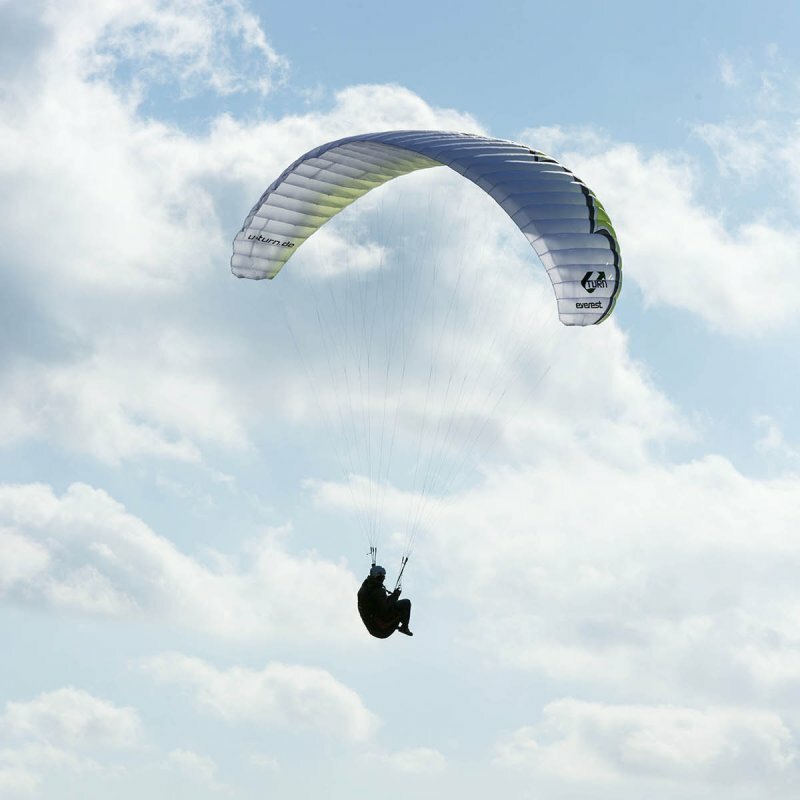 The task was to develop a sufficient performing wing; whose part of the extra weight and volume in the user’s luggage is not charging too much, thus the wing is durable and keeps for a long time its well balanced characteristics offering a lot of fun with a good glide. We found out that many pilots use their light weight wing not only for mountaineering but rather also for leisure flying. For this the EVEREST comes with an extra portion performance and climb ability. The flat aspect ratio is 5,5 and in size 16 the EVERESTs trim speed is between 43 and 47km/h fast, accelerated up to 58km/h. The bigger sizes (19, 21 and 23m²) are just below these numbers. “On a normal thermal day the performance reaches up to the of a standard EN B wing, “but in demanding conditions the concept shows its roots” says Strobl. Patrik Gollnhuber, as well in mountaineering and flying very ambitious, could do several smaller cross country flights in the design and tuning phase. U-Turn co founder Thomas Vosseler points it out: “We accepted a few gram more weight and gave the wing the size to be a full-value glider with a lot of fun and high safety level. The elaborate material mix in the EVEREST, whereby Strobl was not only focused on weight reduction, but rather durability too: “No one profits when the wing is a super light one, but after 50hrs use the performance decreases dramatic,” the chief designer points out. By this reason he used Skytex 38 (38g/m²). Nearly 100% of the higher loaded areas in bottom and topsail are made of this fabric. 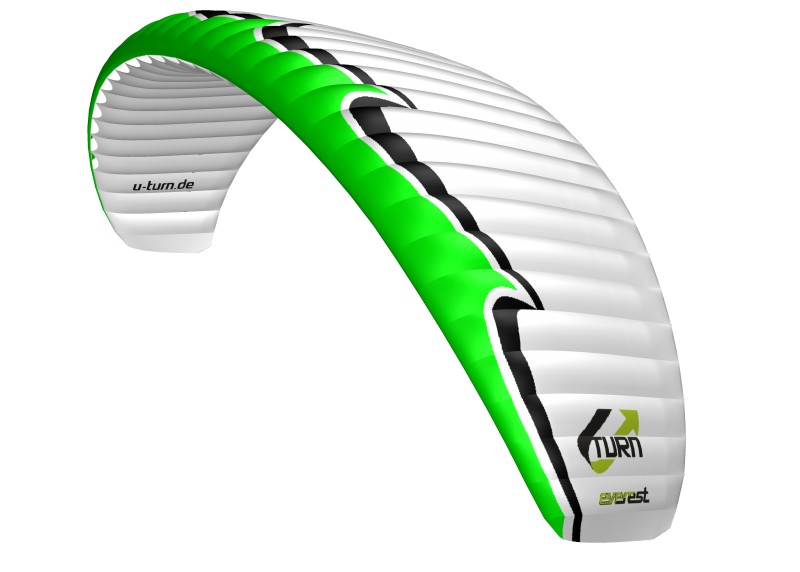 The material uses U-Turn for years in high performance wings. To minimize weight and packing volume in the new design „we decided to connect the A and B attachments completely on the profile. With this we are saving the V-Ribbs and spread the load over more attachments on the profiles.” This means there is a lot less load per attachment for the Skytex 27 “Hard Finish” material and so for a long time a good profile “wear resistance.” the remaining areas are made of Domenico Dokdo10. “In the section of 25-27g fabrics this polyurethane material is the far best in our opinion” so Strobl. The EVEREST is a sleek wing with a strong performance, who will have the same performance after hours many flying! The EVEREST is available in the sizes 16 (2,25kg), 19 (2,46kg), 21 (2,65kg) and 23 (2,84kg) covering a weight range from 60 to 110 kg. The mix of Skytex 36, Dokdo10 and Skytex 27 „Hard Finish“ rib material grants a sturdy good performance and a lot of fun. Especially the wing is equipped with the PPN system. Because of the increased number of attachments points in the A and B lines Strobl could use a Liros DC 45 (Dyneema, 0.55mm diameter) for the top lines, which leads to volume and weight reduction. The use of 7 different dimensioned line types in the wing grants the sturdy trim and so a lot of fun. Arrange a test flight and convince yourself!